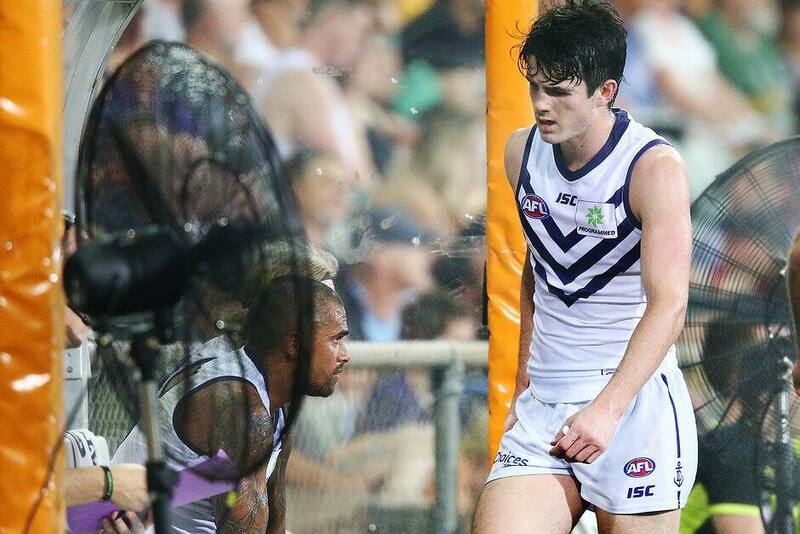 Andrew Brayshaw cools down during Fremantle's clash with Melbourne. Midfielder Andrew Brayshaw is expected to miss three weeks with a groin injury sustained during Fremantle’s clash with Melbourne at TIO Stadium on Saturday in Darwin. The first-year has played every game to date of his debut season. “Andy’s got a slight groin strain,” high performance manager Jason Weber said. “He was able to play through and he did really well. Buy one adult, get two juniors free when Freo take on Port Adelaide! Fellow first year midfielder Tom North is also expected to miss up to three weeks with a minor hamstring injury sustained late in Peel’s clash with Subiaco at Leederville Oval on Friday. North had returned a fortnight ago after undergoing training to build up his fitness. “Tom’s doing ok. He had a couple of weeks off recently for a training block and he’s done really well,” Weber said. “In extending himself late in the game he’s done a little bit of damage to his hamstring, so he’ll be about two to three weeks. Hayden Ballantye missed Fremantle’s clash with Melbourne due to an ankle injury and is expected to miss two to three weeks. “Hayden had what would be termed a high ankle sprain,” Weber said. “He was able to play through in our last game at Optus Stadium against Brisbane and he did a really fantastic job with that. Weber said both Nat Fyfe and Aaron Sandilands are moving forward with their respective hamstring and calf injuries. “Nat’s progressing well. Obviously, it’s a challenging injury for him but he’s very positive and working really hard,” Weber said.